Dura Doggie Keeps On Growing! As the holiday season quickly approaches, Dura Doggie as well is moving forward at full speed. We recently traded our sunny California skies for the crisp air of Chicago over the October 14th-16th weekend to attend the annual HH Backer Christmas Pet Trade Show. Representing Dura Doggie were college friends, CEO Raad Mobrem, CFO Chase McElroy and CTO Frank Jones. Newest member, Elaine Vigil joined the guys to round out the team as part of the sales department. Proud to present the latest line of Dura Doggie’s Chews Your Cause socially conscious dog toys, the young and empowered team looks to change the face of the pet products industry. Named by Tradeshow Week as one of the 200 largest tradeshows in the US, the HH Backer Christmas Pet Trade Show features more than 600 exhibitors with over 1,100 booths displaying everything from doggie boots to eco-chic pet beds. 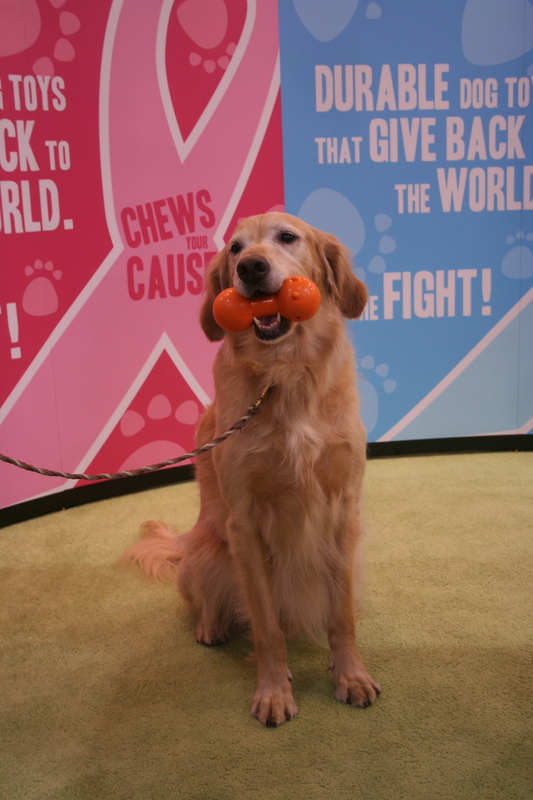 Dura Doggie’s presence was felt as part of the new product showcase at the front of the show and many visitors were drawn to the booth as a result of participating in the show’s scavenger hunt. Side note: the answer to our question “Who designed the Dura Doggie logo?” is Chase’s Mom! A little known fact is that the logo cutie was designed after Chase’s childhood puppy, Lucky. The bright, cheerful booth paired with a virtually paperless system for staying in contact with all our favorite customers was a big hit at the show. Even though this trade show was a first in the pet industry for Elaine, she proved herself a promising asset to the Dura Doggie team. We even got a break from the bustling show to explore a little of what Chicago has to offer, visiting Millennium Park to see Cloud Gate, the beautiful mirrored sculpture in the center of the city. The value of each team member is apparent at Dura Doggie, with the 3 co-founders taking active roles in preparing and executing the trip to the show. Growth within our company is also showing, because in addition to our stellar new sales person, Elaine, we have also brought on Sam, The Awesome Intern. Sam currently attends Vanguard University and works wonders with all things audio and visual for Dura Doggie. The energized team is committed to their mission of giving back while excited to be growing and moving forward at the same time. 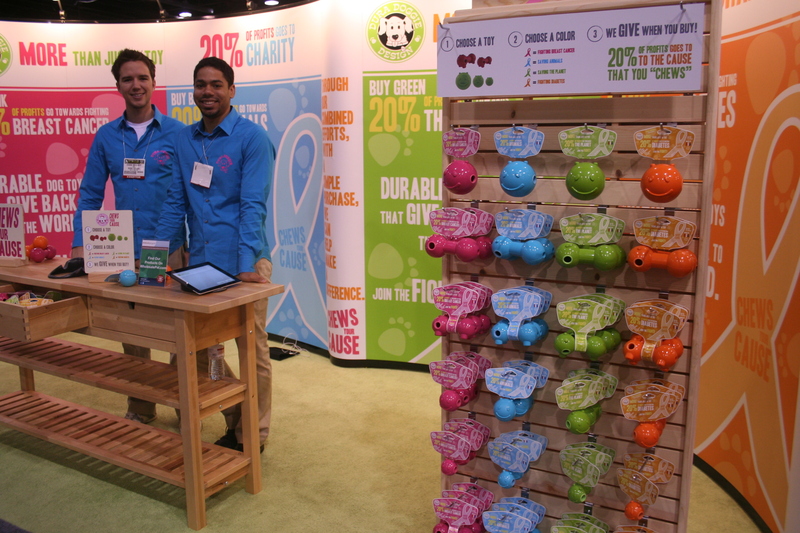 Raad, Chase and Frank are looking to the future for more opportunities to help make the planet a better place, change the face of the pet industry and continue to grow the Chews Your Cause Campaign. We were thrilled to find out about you through Dr. Marty’s team reviews (specifically David S. Greene’s) and ordered your products. Baldwin still has his little blue toy…and his ball you sent as a gift. These are his favorite toys, and this give me tremendous joy to see him cuddle up with them. We got them over a year ago, and that is amazing. Other toys have come and gone, but his little Dura Doggie toys are still in the toybox!